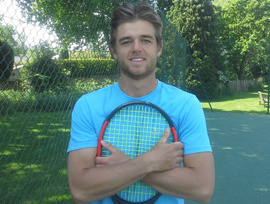 LTA Level 3 & PTR Professional Degree: Law with Business LLB Bradley is a former world ranked junior and national tour player. Vast experience in performance training and development. He has captained the U16 boys and girls Sussex teams as well as currently joint captaining the Mens Sussex Team. 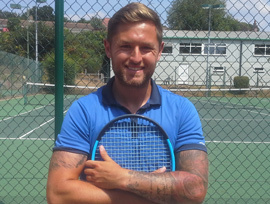 Bradley heads up the coaching programme at The Weald and is available for individual or group lessons. LTA Level 3 coach. HND Leisure management Tom is a former Hampshire County player and has a lot of experience representing clubs at National League level. He has 13 years coaching experience from developing and coordinating school programmes to captaining Hampshire U14 County Cup team. Tom has always had a passion for developing grass roots tennis. He enjoys working with tots through to veterans of all abilities. Tom is available for group or individual lessons. LTA Level 3 coach. Jarryd was playing on the professional tennis circuit where he achieved a world ranking, one of his highlights was winning a professional £15,000 event, He is a former hitting partner to woman’s world number 1”s Ana Ivanovic and Jelena Jankovic, And also men’s world number 1 at the time Novak Djokovic. Currently coaching world number 450 and former junior Wimbledon champion Tom Farquharson. Vast experience working with all level of players. Jarryd is available for individual or group lessons. 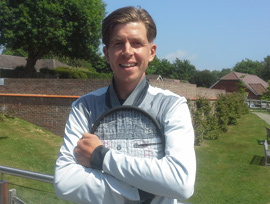 Adam is a LTA licenced Level 3 tennis coach, a former GB wheelchair tennis player and has a world ranking of 10. 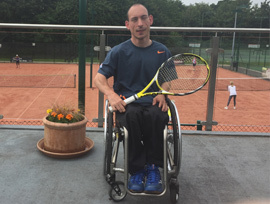 Adam coaches all forms of disability tennis LD, wheelchair tennis and sound tennis, group coaching and is available for private lessons. We run an extensive programme of coaching that covers all ages and ability ranges, whether you be a beginner, a rusty player coming back to the game, or a seasoned county player. Our coaches also run extensive Mini Tennis and Junior Tennis programs and also run School holiday camps. For coaching enquiries, please contact Bradley on bbanttennis@hotmail.com or one of the tennis coaches using the contact details above. The Weald is the proud Winner of the LTA Tennis Sussex "Club of the Year 2013" and achieved the LTA's Tennis mark accreditation in 2015.